Over the years I’ve become a dab hand at travelling with just a carry-on bag. 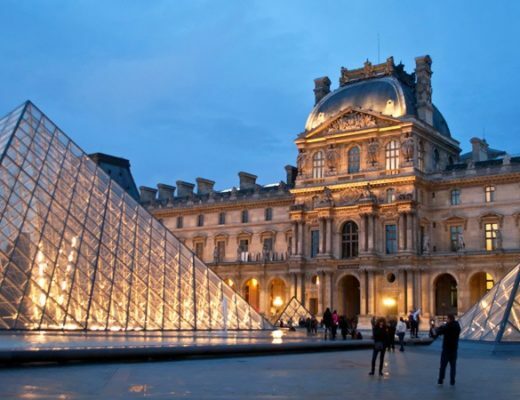 Unless I’m heading off long-haul or long-term, I can easily manage a city break or a summer holiday week without having to check in a suitcase. But cold weather means bulkier clothes and that makes it more of a challenge to squeeze everything in. And when I saw the temperatures in Tallinn were hovering around a snowy -10 degrees, I realised my usual autumn/winter city break uniform of long boots, skinny jeans and cardigans wasn’t quite going to cut it. I was going to need to get prepared for some serious cold weather. Packing for a snowy city break is a bit of a balancing act. 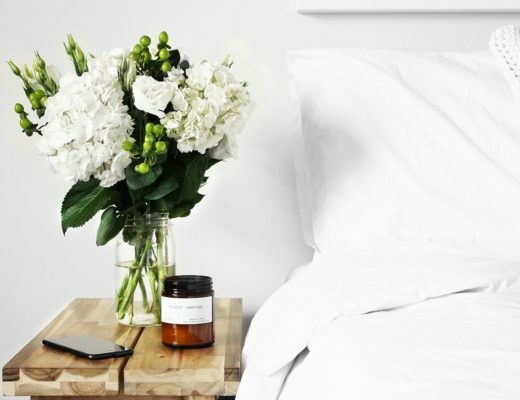 You don’t want to be shivering in your everyday coat or slipping about on the ice in heels. But you don’t want to be dressed for an Arctic trek in walking boots and waterproof trousers either. The goal is somewhere in between – warm enough to spend time outside but stylish enough to fit in with the locals. But the packing lists I found online were more of the ‘chilly winter’s day’ than ‘depths of a deep freeze’ variety. 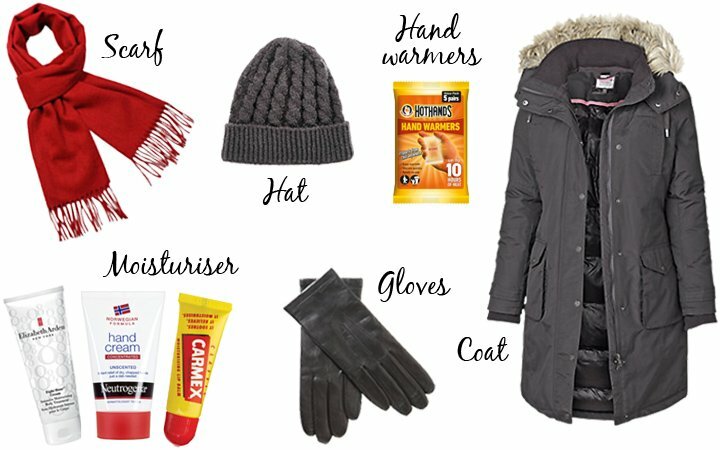 So after a combination of research and trial and error, here’s my advice for what to pack for a city break to the Baltics or Scandinavia in winter. Packing for a cold climate is all about layering – lots of thin layers trap the heat and keep you warmer, plus they’re much easier to pack than trying to squash a giant fluffy jumper into your case. For a three-night long weekend, I generally wear one full set of clothes and pack another set, plus underwear and some cosy pyjamas. And for going out at night I add some chunky or colourful jewellery to smarten things up. Thermal layers: Thermal base layers are the key to keeping warm. You can pick up inexpensive thermals from Uniqlo (try the Heat Tech Extra Warm range) or Marks & Spencers. 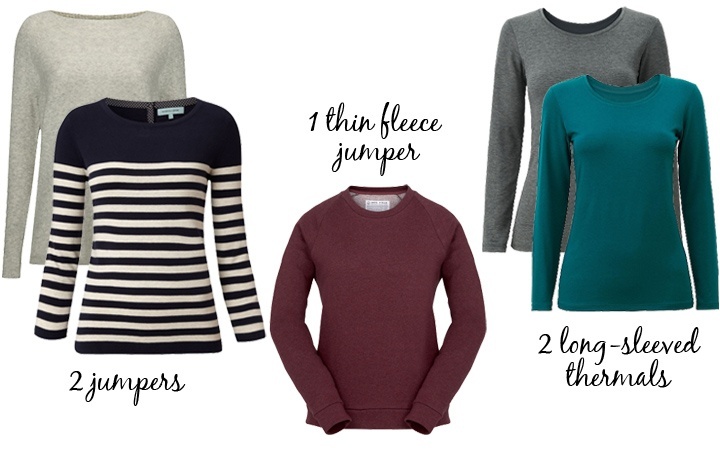 Or the Rolls Royce of thermals are New Zealand brand Icebreaker’s merino wool range. I start with a long-sleeved thermal top and a pair of thin thermal leggings. Then if it’s really cold I top that with a ultrathin fleece under my normal jumper. 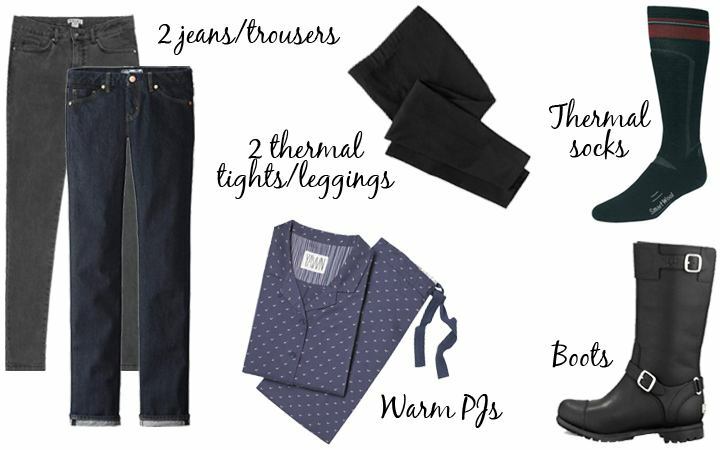 Tops and bottoms: I go for fairly thick jeans or trousers that aren’t too skinny so there’s room to fit a pair of thermal leggings or tights underneath. And longer-style jumpers that go down below my hips to keep the heat in. I have a couple of woolly jumpers from M&S that are big enough to fit a few layers underneath and add a splash of colour – try merino wool or cashmere for maximum warmth. Coat: A thick padded parka-style coat with a fur lining really keeps the cold out. Look out for a longer style that goes down below your hips to make sure no draughts get through, and a hood to protect against any snow showers. I have an old one I’ve had for years, but this North Face one is similar. Boots: Having frozen feet makes things miserable, so you need boots that are both warm and waterproof. Look out for ones with sheepskin or fake fur lining to keep your feet cosy. A thick rubber sole will help stop the cold coming through, and make sure they have good grips for when the ice turns the pavement into an skating rink. These black leather boots from UGG manage to combine looking smart with being weatherproof. Team them with a pair of thermal Smartwool socks which are designed for skiing. Hat, scarf and gloves: I pack a hat so I don’t have to use the hood on my coat unless it’s snowing (it’s a bit like wearing blinkers and I can’t hear anything with it up!). I have a woolly beanie with fleece lining, but quite fancy a furry hat next. 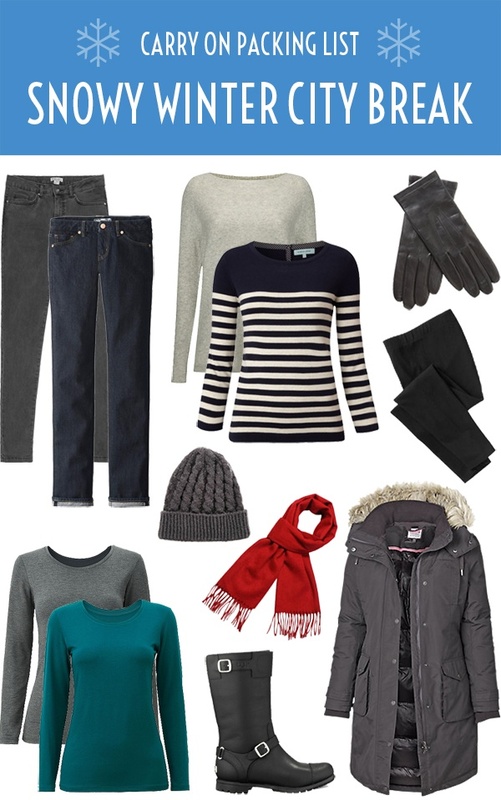 Also pack a big scarf to keep the chill from around your neck, and a pair of gloves. Lined leather gloves are good if you’re taking photos as you don’t have to take them off, but mittens are warmer (and if your fingers get really cold you can wear gloves underneath). Extras: Bitter winter winds can dry your skin out so pack some heavy-duty moisturiser. Elizabeth Arden Eight Hour Cream is pricey but worth the hype and a tube lasts for ages. There’s a lip balm in the same range or I like the Carmex ones, and Neutrogena’s ultra-concentrated Norwegian formula hand cream. Hand warmers are a good idea too – you can put them in your pockets for an extra dose of warmth. 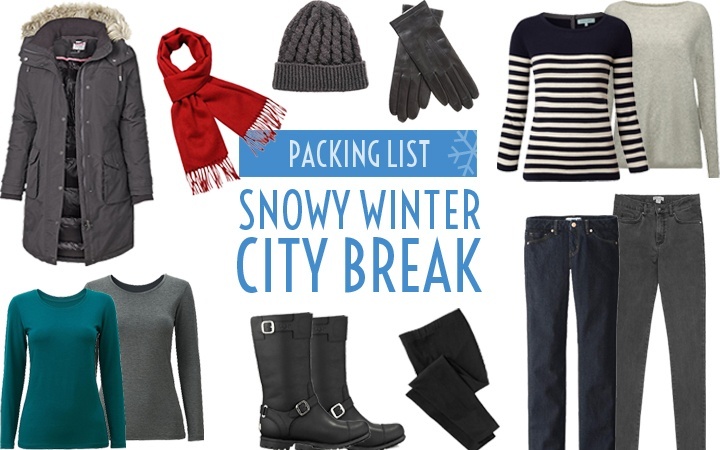 So that’s my cold weather city break packing list – what are your winter packing tips? I really like Cuddleduds to wear as a warm layer under clothes. They add warmth and easy to wash. I hadn’t heard of them but they look really good so one to try out (I practically live in thermals all winter!). I have some thin liner gloves that are heat sensitive so you can keep them on and still use your mobile for taking those fabulous pics I’ve seen on your Instagram feed! Thanks Suzanne – I have some silk inner gloves I bought for skiing so did pack those too (they’re white though so I do look a bit like a mime with them on!). Another vote for Uniqlo and Heattech here – I love the fact they’re so thin but keep me really warm. And glove liners are great too. They’re great – I have about 10 lots and wear them every day from about October to March!